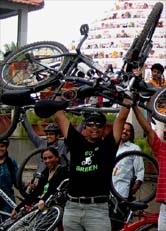 10-May-09 Go Green Sunday Ride - GGI-Group size: 4000+ Professionals, Increasing on day to day basis, Come & join us 2 serve Mother Nature. Everyone of them were their on time and Since TV-9 person wanted to shoot some clipings and wanted to have some interview, we got delayed by 15 minutes hence started by 7:10am. We were 22 particpants and there names were as below. 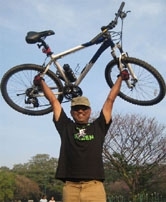 Jaynagar 4th Block - Jnagar 3rd block -Sount end Circle - Bangalore Hospital - Lalbagh West gate - Minerva Circle - Hudson Circle - Cubbon Park - City Libarary - Vidhan Sabha - Bangalore Press Club. 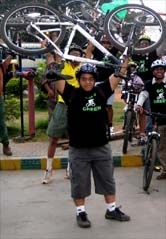 Few Snap shots of 10th May 2009 Go Green Ride.